When the 'third eye', also known as the third umpire was introduced in international cricket in 1992-93, 'line decisions' like run-outs and stumpings were identified in his domain of responsibility. Close line decisions were those that went either way in the pre-TV umpire days. It all depended on the umpire's alertness and reflexes. Many players felt in those days that the batsmen tended to be given the benefit of the doubt. In fact, this is how it has always been in cricket. The cat would be out of the bag at the end of the day's play or during the intervals, when one would get to watch the slow-motion replays on TV. In fact, in the middle of a game, the reserve players would often give the 'thumbs up' or 'thumbs down' signal to their colleagues in the middle, depending on the team they were part of. I have been in a situation wherein a fielder has come up and told me that the batsman I had declared not out was in fact short if his crease. They had obviously got the message from the people watching on TV in the dressing-room. 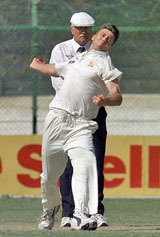 Umpire Dave Orchard watches Glenn McGrath in his delivery stride. Later, the 'third eye' was also entrusted the responsibility of judging hit-wicket decisions. I personally never had a problem with this particular dismissal. Any umpire would be ok as long as he keeps an eye on the striker's movement after playing a glance or a hook shot. A very strange incident took place in a Test match in the 1954-55 series between the West Indies and Australia. The West Indian Clyde Walcott was in terrific form. During one of his long innings in the series, he glanced Bill Johnston off his back foot towards fine leg. The eyes of all the people on the field shifted to the ball, which was being chased by Doug Ring. Nobody realized that Walcott's back foot had touched the leg-stump even as he executed the shot. The leg-bail had fallen down as a result of the impact. Believe it or not, Walcott picked it up and quickly replaced it. The stroke ended in a boundary! It was only at the end of the day's play, when the Australians saw the episode on screen. They started jumping up and down and confronted Walcott. "Hey man, what were you doing"? , they asked him. He admitted his 'offence', but it was too late then. When it happened, the Australian players and even the umpires missed it completely! Since the 1996 World Cup, the third eye has also been required to indicate whether the had cleared the ropes or the fielder touched it while stopping, or a catch was completed inside the ropes or the fielder had touched the rope. Catches taken close to the ground also came to be referred to the third umpire, who then checked whether it had been taken cleanly taken or bounced before the fielder clasped it. During the 2002 ICC Champions Trophy in Sri Lanka, the ICC for the first time decided on an experimental basis to introduce the 'Hawk Eye' to rule on LBW appeals. The field umpire would turn down the appeal on his own if it was 100% clear to him that it was not out. But if he was inclined to give the batsman out, he would ask the TV umpire to decide on the verdict. However, there was a queer incident involving Dave Orchard, the South African umpire. He declared a batsman out leg-before without consulting his off-the-field colleague. But the TV replays clearly showed that the ball would have missed the leg-stump! A few moments later, after probably seeing the batsman's reaction and taking into account the relatively low intensity of the appeal itself, he changed his mind and sought the help of the TV umpire. 'Not out' was the reply! Many cricketing pundits did not approve of the 'Hawk Eye'. The outcry prompted the ICC to do away with it for the time being. I find it hard to understand that a scientific innovation is not being taken seriously in these times. Technology has to and should be accepted in every field. Wouldn't it be ridiculous if corporates, banks and industrialists decide to do away with computers and other gadgets that have become necessities in day-to-day life and revert to the old methods of processing and maintaining records, statements etc.? Yours truly has always held the view that getting as close to perfection as possible was preferable to taking a chance that could be blighted by human error. The Hawk Eye has time and again proved the umpire wrong. It is a great blessing if the wicket is a turner and the bounce uneven. Any delivery that is pitched slightly outside the line of the leg-stump is another hazard of sorts for the field umpire. It is quite common for the batsman to get an inner edge that is not detected by the umpire. And of course, the height at which the ball strikes the batsman's pad is of great importance in leg-before decisions. Some wickets are a lot bouncier than the others, and it is quite possible that an umpire who is used to wickets with standard bounce, will rule against the bowler on a strip like the one at the WACA in Perth. Although the Hawk Eye experiment was discontinued after the ICC Champions Trophy, many players would support it if brought back. Their primary contention is that accuracy and consistency can be maintained by technology. Human errors can often be the difference between a successful career and an unsuccessful one. Considering that there is so much at stake in the game nowadays, the players will be delighted if the possibility of human error is eliminated. This one-step-forward-two steps-backwards approach isn't the right one in the modern era. The ICC will have to do a rethink if all the playing nations insist on the Hawk Eye being used for leg-before decisions. I think it's a must.